When Hannah told me that their wedding was going to be in the morning - I was so thrilled! The key to amazing photos is planning your pictures around sunrise or sunset. Then you get that golden light that is so gorgeous! Early Saturday morning I headed to their wedding with hopes that the morning sun would shine - and it sure did! Phil and Hannah first met each other at their church in Chicago and I think that says a lot about their hearts and the relationships they value. It was so sweet to see their church group there at their wedding (they came all the way from Chicago!) And Phil’s parents and sister we able to travel all the way from South Korea! These two have such a pure love about them and it was so evident throughout the day. From the sun shining on them for their portraits to the people who surrounded them with support, every element of their day was so genuine! My favorite moment of the day was right after their first look when Phil led them in a prayer before the hustle and bustle of their day began. Wedding days can be so busy and overwhelming, it was so sweet to see them pause and remember the most important element of the day - their covenant promise to each other. I know each wedding is different and each couples beliefs are different, but it is so sweet to see when couple takes time to soak in what matters the most to them. 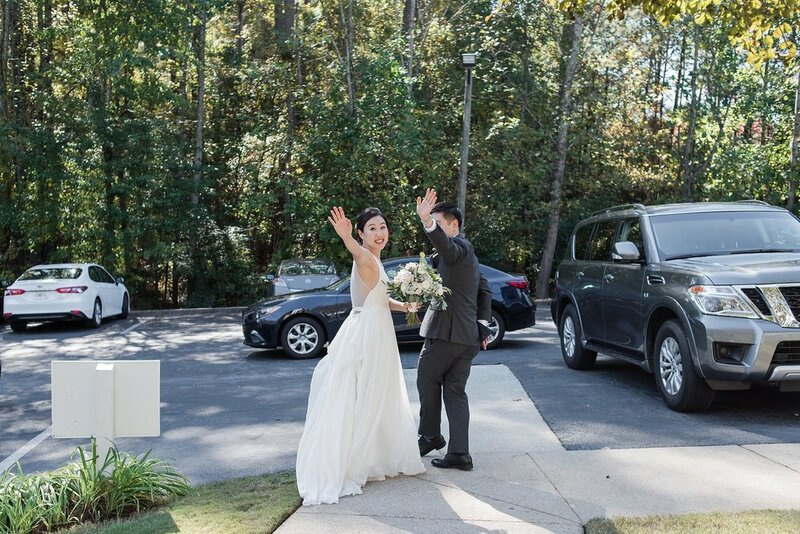 Little Gardens in Lawrenceville was the perfect place for their wedding! The elegant gardens with the morning sun was the best background for Phil & Hannah’s wedding celebration. I am so happy these two found each other! Here are some of my favorite moments from their wedding. Special thanks to the amazing vendor team! Such a joy to work with! Their sweet moment of prayer before the day began. And I can’t believe how beautiful this sunrise was! Gorgeous morning light! A few moments of prayer before the ceremony. Hannah’s sister Grace sure does have a gift of words and pulling peoples heart-strings! There were a few times throughout the day that her words brought everyone to tears. “don’t cry, don’t cry, don’t cry” - said everyone! What a sweet sister she is! I love taking a few pictures of the bride & groom right after their ceremony (even if they did do a first look). It just feels more official and give you those sweet “just married” pictures! I loved that for their first dance at their reception, they had a choreographed dance that was so elegant and fun! I had no idea these two were such amazing dancers! Not only are these two both Doctors and great dancers, but they also play violin. Is there anything they can’t do? Seriously a power couple!